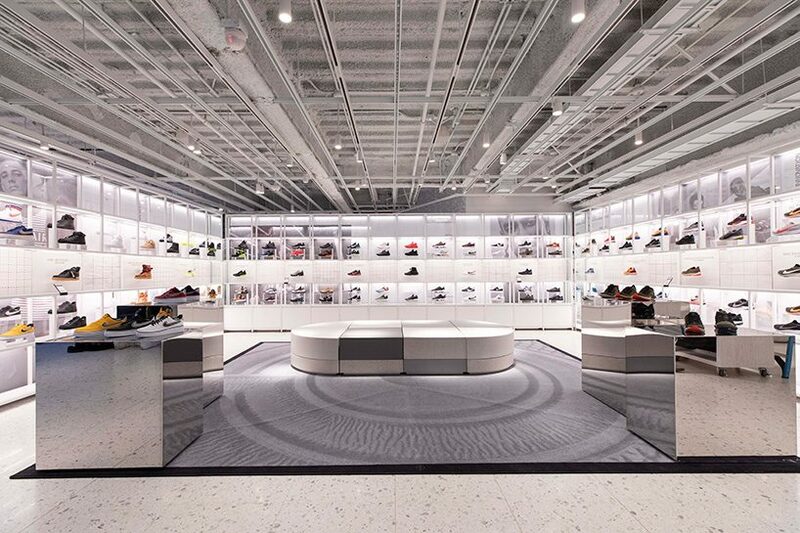 Nike 5th Avenue NYC Shoe Lab Showroom – Manton Cork Panels Installed on display walls (painted white). A natural product, cork warms and enriches any interior. It can be used on the floor, walls or on the ceiling, and is now available in a wide range of colors, from its familiar honey tones to green, red, chocolate, or nearly black. Cork, of the natural wood family, can be stained or painted to compliment any décor. Cork always blends in well with other decorations and with any sort of furniture. Rightly valued for its visual appeal, its functional side is also very attractive. In addition to giving thermal and sound insulation, it only needs minimal maintenance. Flooring tiles are produced from cork granules agglutinated with synthetic resins under heat and pressure. There are tiles of all thicknesses, densities and finishes: just polished, waxed, varnished, urethane, or vinyl-coated. This last group can be produced in a wide range of models, using a decorative sheet between the transparent PVC and the agglomerate underneath. The use of silk screen printing has made the range of decorative possibilities still wider. Cork tile pavements are quiet, warm and comfortable. Being highly abrasion resistant, they are often used in all sorts of public buildings including schools, hospitals, shops, offices, museums, libraries, airports, hotels and restaurants. The distinctive look and durability of cork tiles makes them the perfect choice. In the home, cork tiles can be happily incorporated all over the house. Their resistance to humidity and their non-slip surface make them especially suitable for the kitchen and the bathroom, while they are a luxurious and long-lasting alternative for the living room and bedrooms. There is a wide variety of tiles and decorative panels. These can be made of natural cork sheets or agglomerate, and can be their original color or have colored designs added. Cork wallpaper is made of thin sheets of cork glued on to colored backing paper. The wide variety of possible bases means that there is an enormous range of products available. Continuous rolls of decorative cork are used in the same way as the paper. Being thicker, they are recommended for heavy duty use. In recent years, the increase in the price of oil and its derivatives has brought an increase in the use of cork as a means of saving energy. An air cushion is one of the most efficient means of insulation known. Cork, with its cellular structure where air is a major component, offers a high level of thermal insulation. Consequently, a large percentage of Portugal’s annual production is used to make expanded cork agglomerate or black agglomerate. This agglomerate is made from cork granules of various sizes, but of a larger size than that used in the production of floor tiles. The particles are bonded with their own resin in moulds using pressure and super-heated steam. The blocks are then cut into planks which are then finished as required. These days, expanded cork agglomerate is widely used as insulation in roofs, walls, floors and ceilings. When, for example, it is used as a floating floor between two concrete floors, the expanded agglomerate acts simultaneously as thermal insulation and to reduce noise between the tow levels. As it maintains its properties at very low temperatures, expanded agglomerate has a wide range of uses in the refrigeration industry. These include the construction of cold rooms, insulating storage tanks and lagging for pipes carrying water or other liquids, at both very high and very low temperatures. Expanded agglomerate maintains its insulating properties almost indefinitely in all these uses. In addition to these exceptional properties, expanded agglomerate does not give off chloride, cyanide or any other toxic gases when burnt. It is the perfect insulation, as it has properties that no other form of insulation can claim: it offers the lowest level of heat conduction among fire resistant insulators and simultaneously the highest elasticity of the highly heat resistant. Yet another use of cork in the construction industry is as expansion or compression joints in concrete structures, including dams and tunnels. In these cases, various types of compound agglomerates are used, while others are used to absorb vibration in buildings with metal structures. Hockey, golf and cricket balls, as well as baseballs and shuttlecocks often include cork components, as do table tennis bats, the pea in whistles, golf clubs, dartboards, fireworks and bungs for gun cartridges. Due to its attractive appearance and its pleasant feel, cork is also used in the production of tableware, gifts and novelties, such as engraved boxes, pictures and memo boards. Some of the other products which use cork are mats and coasters for plates and glasses, bath-mats, cigarette boxes, desk pads, ashtrays, and calendars. Cork, in combination with other products, specifically leather, is also used in a wide range of products such as handbags, traveling cases, wallets, purses, document holders, and, more recently, cork textile for the clothing industry. Perhaps the most exciting development in the use of cork has been as the protective heat shield in missiles and spacecraft, including the Space Shuttle. In this case, the aim is to protect the rocket against the extremely high temperatures caused by friction on re-entry into the Earth’s atmosphere. Fire retardant cork agglomerate is used in warships, allowing highly efficient insulation of steam pipes and ventilation equipment. Its flexibility and low weight also make it the most efficient material for insulating pipes in small spaces. In addition, it has been used in the internal lining of submarines. The fact that cork is slow-burning and its property of energy absorption make it a good means of transporting radio-active isotopes. The risk of radiation contamination after damage to the isotope container requires the use of a special covering which is highly heat resistant. The isotopes are placed in a small container which is then placed in a larger one. To ensure complete protection, the outer container is lined with cork. As cork floats, natural cork is used in oil and petrol level indicators, but its most important use in the car industry is in cork/rubber gaskets. Nowadays, these gaskets are as essential as petrol or diesel for the automobile and truck industry. The materials used combine the compressibility and elasticity of cork with rubber’s mechanical resistance and stability of size. This makes them the most suitable gaskets for oil tanks, the cylinder head, carburetor and gearbox. The cork/rubber combination is easy to cut and, due to its flexibility and resistance, it can be used for gaskets with very narrow borders. The electrical industry has also developed cork/rubber products to stop leaks of the fluids used in modern transformers. Similar products are also used in the manufacture of electrical switches, lightning rods and other transmission equipment, in addition to conductor wires and washing machine lids. The majority of machines cause vibrations. Not only does this create bad working conditions, the vibrations can spread to other machines or even to the building itself, frequently leading to an intolerable atmosphere. High density expanded agglomerate planks are the cheapest, easiest and most efficient means of insulating machines and damping vibrations. Consequently, working conditions are improved, the machinery’s life expectancy is increased and the risk of costly structural damage is avoided. Composition agglomerate of cork and rubber used for pavements combines properties of having high resistance to wear, being non-slip and sound absorbent. It is resistant to oil, grease and salt water, which makes it suitable for industrial and vehicle flooring. Buses, carriages, taxis, ships, gymnasiums, laboratories and factory floors are just some of the places where it is normally used, either in the form of the whole floor covering or in non-slip industrial mats. In laboratory areas, cork is ideal as a base for the protection of work surfaces, in entomology and dissection, in support rings for bottles and for special stoppers. There are innumerable other uses for cork; the ceramic industry uses discs to smooth rough edges and eliminate defects; it is used in small clutch linings; for polishing diamonds; as a stopper in organ pipes and as mutes in wind instruments; for the cylinders in packaging machines when using waxed paper or cellulose film; in bathroom fittings, filling for mattresses and cushions; as a backing sheet for sandpaper. In these and other ways, cork is increasingly indispensable in today’s industry.